This segment of HBO’s Real Sports with Bryant Gumbel is beyond belief. No football teams should ever punt or kick. The only reason they do is fear of risk taking. Which is sadly relevant to the idea of innovation. TRULY AMAZING. This coach, Kevin Kelley of Pulaski Academy did the numbers and figured out something stunning. I guess it’s sort of what the word means. “To punt,” generally means to give up. This is one of the most amazing stories I’ve ever heard. I’m a huge fan of HBO’s Real Sports with Bryant Gumbel. You want to talk about storytelling, this is a show that has mastered it. They do such a good job, you end up not even caring what sport any given segment is about because you know that even if it’s about the World Badminton Championships, they are going to tell you some human story that will leave you either shaking your head in amazement, laughing hysterically, or with tears in your eyes. They are masters at it. So last week they had one of the most incredible stories ever. 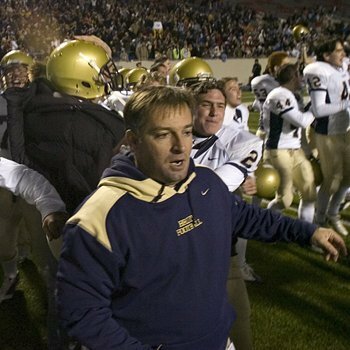 It is about Kevin Kelley, football coach for Pulaski Academy high school in Arkansas. He began questioning the wisdom of punting on fourth down, and kicking away on the kickoff. His stunning conclusion, supported by the data, is that you shouldn’t ever do either. The numbers show you will do better in the long run by always going for it on fourth down and always doing an onside kick for the kickoff. He’s been doing this for several years. They no longer even have a punter, and their kickoff teams have come up with a dozen variations for the onside kick. The result — three state championships in six years. The simple and sad answer is risk aversion. Even though the numbers say you should do these things, most teams don’t. The reason is that both calls — going for it on fourth down and doing the onside kick — are perceived by the fans as highly risky. Even though they aren’t. But once again, perception is everything. In the segment one statistician says he analyzed 3,000 circumstances in pro football when the teams should have gone for it on fourth down. But in fact only 4 percent of the time did they do it. The rest of the time they just went ahead with punting simply because it is perceived as the correct move. They didn’t want to do what is perceived as the risky move, even though it isn’t. It’s both amazing and depressing. People are risk averse by nature. Which brings us back to the problem with innovation. Everybody talks a big story about wanting to be innovative, but when they actually look at the supposed risk involved, they opt to do what is perceived as the safe thing. They would rather be risk averse and concede how boring things are than to actually take any chances. The human deck is stacked against innovation. I’ve been spending a lot of time lately complaining about the lack of willingness of the science community to dig deeper into the visceral/intuitive side of communication. And I stick with that complaint. But that said, this is an example of the opposite situation. This is a sport that is so deeply invested in the intuitive/gut instinct side of decision making that it is unable to actually yield to the cerebralists with their data. Which is fascinating. Kevin Kelley, head football coach at Pulaski Academy in Little Rock, Ark., uses his own research to back up the mantra that his team should never punt, should always kick onside kicks after a score and should never return punts. If this sounds too unorthodox to be effective, Kelley’s theories have resulted in a 104-19 record since he became head coach at the high school, and statisticians have supported his theory on the relative value of punting. REAL SPORTS correspondent Jon Frankel visits the 42-year-old Kelley in Little Rock as his team prepares to seek its third state title under his leadership.